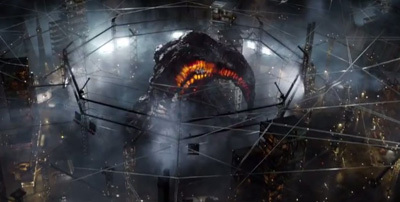 Edwin Davies: How did Warner Bros. manage such an amazing opening for Godzilla? How well do you think the film will do from here, considering how solid the reviews have been in comparison to the divided word-of-mouth? Bruce Hall: The trailers were intriguing and atmospheric. They cast respected actors. They teased the monster - hey, they got the roar right! They released a trickle and then a stream of images as the release date grew closer. Now, it's clear they got the monster right. He's fighting what, they said? It flies? Now I've GOT to see this! As much as people chuckle at the classic Godzilla films, with their rubber suited monsters and cardboard sets, I think most of us have secretly harbored a desire to see it done really well. And it was clear early on that at least the look and the tone of the movie were going to be worth checking out. I feel Warner Brothers did a very good job of building up interest across a broad base and that if you're going to "Americanize" a Godzilla movie, even before it was released it looked like they'd taken a solid crack at it. More people were impressed than even I would have thought, and I was as giddy as a child going in. I've now lived long enough to see both Star Trek AND Godzilla crack the mainstream. Matthew Huntley: Because I reacted so strongly to Godzilla, I find it hard to believe the general audience reaction could be this polarized. Then again, it takes all kinds, and the movie may not be everyone's cup of tea. Despite the coming of X-Men next weekend, I think Warner Bros. can still get a solid second weekend for their summer tent pole and continue to attract good crowds. It helps that next week is Memorial Day, and even though we'll likely see huge drop-offs for the film after that, I'm hoping $250 million is still in the cards domestically, which would be enough to cover its production budget and much of its P&A, because I'd definitely welcome a sequel (so long as it was handled with as much care and detail as this one).